Palm trees are grown in tropical regions perennial oil crops,has the advantages of big yields low cost.Palm oil is already one of the world largest edibel oil production,is widely used in large food processing,cooking and eating areas of bio-diesel production.Oil palm tree main producing area distributes tropic area between the south latitude 5～10°and the north latitude 5～10°near the equator; It is a kind of important tropic oilseed plant. 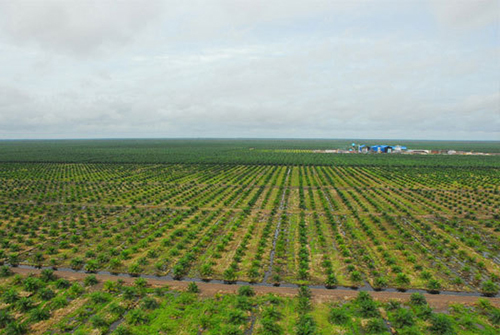 Oil palm begins to outgrow fruits about two years and a half after being transplanted. Firstly, the output is very low, 8～15years is blooming time and output reach maximum; it gradually aging when it grows over 20 years; its growth period is 25～30years. Empty fruit bunch,fibre,palm shell are used as fuel. Palm leaves are used as animal feed. Palm kernel cake is used as animal feed. Palm leaves and trunk are used for furniture industry,construction industry, automobile industry,electronic industrial and packaging industry. More and more palm oil plantations are now set up in Southeast Asia and Africa countries. It is a trend that palm oil mill will be mostly welcomed in near future. If you are interested in palm oil plantation and want to set up palm oil mill in advance, Huatai will help you with our advanced technology and best quality palm oil processing machines. Here I would like to introduce you the general situation of palm oil plantation. Recently, China has become the biggest palm oil market. Chinese palm oil consumption takes 17% of the global palm oil consumption.If you already have palm plantation, it is good time that you can start up palm oil mill in advance. Any problem,please leave Huatai a message,wo will solve your problem.